Join today and get $5 off your first order! Plans start at $9.99 a month! If you have a sweet tooth that you just cannot seem to satisfy, you are not alone. We all have our favorite candies, but I don't know about you, but we here at Deal Meisters are tired of the same candies! Luckily, Bocandy has you covered! Bocandy is a snack box subscription that sends an assortment of international candies to the doorstep of your home every month. Bocandy brings you a mouth watering variety of international candies coming from all different countries in the World. They also offer several non-international speciality candies, snacks, and beverages. They offer a great variety of specially assorted snack boxes, as well as several payment plans. Bocandy was founded by Blake Knoblock in 2014. Continue reading this Bocandy review to find out if this is an opportunity that is truly worth your time and money! Bocandy is a very unique snack box subscription service because of their large variety of snack boxes and payment plans. Not only can you choose to pay month-to-month, prepay for 3, 6, or 12 months, but you can also choose from their selection of boxes. There 3 different Bocandy boxes that you can choose from. They provide a great variety so that you get exactly what you are looking for! Bocandy is also associated with the company Bojerky. You can choose to order a Bojerky box right on the Bocandy website. It is an assortment of premium, top quality beef jerkies that we are sure you will love! Bocandy is able to ship anywhere in the world for a small fee. Bocandy offers great variety of international treats that are hard to get your hands on otherwise. Bocandy also offers non-international specialty candies, snacks, and beverages. You have the choice of paying month-to-month, or prepaying either 3, 6, or 12 months in advance. Domestic shipments will arrive much sooner than your international treats simply because it takes longer to ship. Bocandy offers chocolate, but only during from April to September. They do not ship candy in the summer because it will melt between 88 and 94 degrees fahrenheit. Bocandy will provide you with a quote and put together an assortment of candy for your office as well. Bocandy does not have a customer service phone number, they can only be reached via email. Bocandy does not have options for people with dietary restraints or restrictions. If you prepay for a longer subscription and decide you would like to cancel your subscription before it is over, you will not be refunded. You will be billed on the same day of the month that you signed up. For example, if you signed up the 10th of January, you will be billed the 10th of February. If you would like to cancel your subscription, be sure to do so before your set billing day. Bocandy Big Snack Box- "A delicious discovery of both hard-to-find imported and speciality candies, snacks, and beverages. Beverages don't ship every month but, when they do, you are in for a treat!" Asian Candy Subscription Box- "Will include snacks from Japan, South Korea, and other Asian countries. Will sometimes include a beverage. Great for the summer months!" Bocandy Starter Box- "5 to 7 delicious snacks from all around the world- both US and abroad! This box is the starter kit to the Bocandy family! This is a great way to discover new flavors!" Craft Beef Jerky (Bojerky)- "4 Packages of PREMIUM craft Beef Jerky, from places you've most likely never heard. From Alaska to Indiana, from the Bayou to Maine, this jerky is plain good." After you have chosen the box you would like to receive, you will be asked to pick the payment plan that works best for you. You have the option to pay month-to-month, or prepay for 3, 6, or 12 months. We recommend starting out with the month-to-month option to see if it is really worth it for you to commit to a lengthy subscription. If you decide to go with the month-to-month option, make sure you know how to cancel your subscription so that you avoid getting an unexpected charge. Every month, you will be billed on the same day that you signed up. For example, if you signed up the 10th of January, you will be billed the 10th of February. If you would like to cancel your subscription, be sure to do so before your set billing day. If you decide to commit to a prepaid plan, however, keep in mind that you will not be able to cancel and get a refund until your subscription is over. If you need to speak with a customer service representative, you are unfortunately out of luck. The only way to contact Bocandy customer service is by email. Contact Social@Bocandy.com if you need assistance. Bocandy has a plan that will work for almost everyone. Also, the longer plan you commit to, the more money you will be saving in the long run. It is clear that Bocandy offers a great selection of treats. You can order the international Asian candy box, maybe the smaller starter box if you are just getting started, or you could go with the Bojerky box if you are not in the mood for sweets. We love this variety! Most people have had a nice experience with Bocandy. They have a great selection of boxes to choose from, all with a unique touch. People also seem to really enjoy the variety of treats within each box. Bocandy supplies you with amazing international and other specialty candies that are otherwise extremely hard to find. Several people, however, are not happy with Bocandy. First, several people reported that their boxes did not arrive on time, which can be very frustrating. Others reported that they did not really care for the candy, and it was not even labeled in the first place. To top it off, their customer service can only be reached over email so you are stuck waiting for them to reply. Finally, several people had issues cancelling their subscription. To ensure that you do not get a surprise charge, be sure to cancel your subscription well before your set billing day. There are a handful of snack subscription box services that offer international treats and candies just like Bocandy. What really sets it apart is that it offers not only international treats, but other specialty candies and beef jerky. We think that the jerky is a really nice touch because we have not come across other susbcription boxes that offer jerky at all. There are 4 different boxes that you can choose from, and you can choose how often you would like to pay for it. You can pay month-to-month, or prepay every 3, 6, or 12 months. This is really convenient for you because you can simply try it out and cancel, or decide to save yourself some money by committing to a longer subscription. If you are looking for a snack box subscription service that caters to your dietary restrictions or sensitivities, Bocandy might not be for you because they do not have any healthy options. Instead, we recommend Urthbox! Urthbox is a healthy snack subscription service that has options for almost any kind of diet or health restriction you can think of. If you are gluten free, vegan, or vegetarian, they have got something for you! Yes, but not in the Summer. Chocolate melts between 88 and 94 degrees fahrenheit, and many places get much hotter than that in the summer. For Bocandy, summer starts in April and ends the last day of September. Is there a difference between International and Domestic shipments? Yes. International shipments may take longer to ship and may have slightly different contents. Now that you have read this Bocandy review, you are probably wondering if you should consider subscribing or not. If you are a person who loves trying new foods and candies, it might be worth a try. They take all of the hard work out of it for you. Simply place your order for the specific box you would like to try, and wait for it to show up at the doorstep of your home. Also, if you are looking for a Bocandy box for your office, simply send an email to Bocandy customer service for a quote, and they will put together an assortment for you! If you join today, you can earn $5 off of your first month just by simply sharing Bocandy's website on your social media. All you need to do is provide them with your name and email. Also, you have an opportunity to save some money but committing to a longer subscription rather than month-to-month. For example, let's take a look at the savings you could get with the Bocandy Big Snack Box over an entire year. That's a savings of almost $20, which might not seem like much, but any money that you save is a win! Sound like a good deal? Click here to if you are interested in giving it a try! 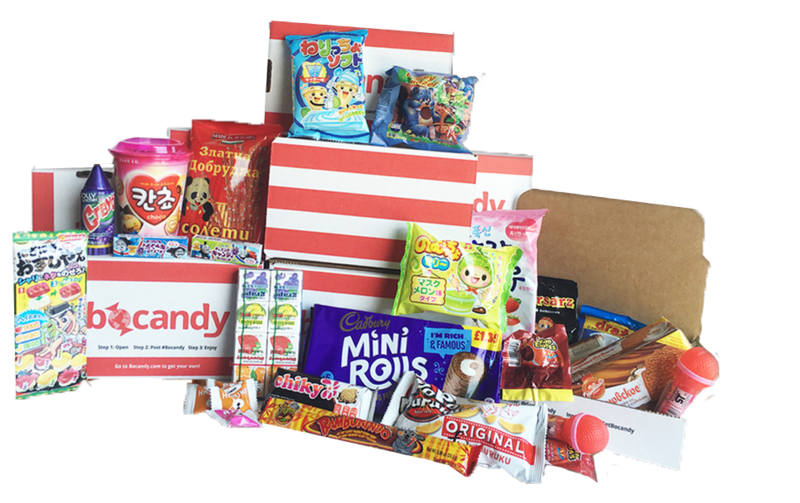 Bocandy is a snack box subscription service that provides you with a great variety of international and specialty candies, as well as other snacks and beverages. They deliver snack boxes right to the doorstep of your home or office for a very affordable price! Thereis 4 different boxes for you to choose from, as well as 4 different payment plans. They have something for everyone and they have the means to make it worth-while! Interested in Bocandy? Click here to get started! Not a huge fan of Bocandy. Once I received my package, i enjoyed the treats that were in my box. The problem was that I was already mad when I received it because it was 5 days later than what I already expected. I also really hate that you can’t reach Bocandy customer service over the phone. On the website, they blame this on being a small company. I don’t buy it. Bocandy is not for me. I don’t recommend. They are such a scam. I paid for 6 boxes and only received one. I contacted customer service and they don’t even answer her emails. I also contacted the Better Business Bureau. They are a terrible company to do business with. Who charges you for a product and never mails it? Bocandy does!